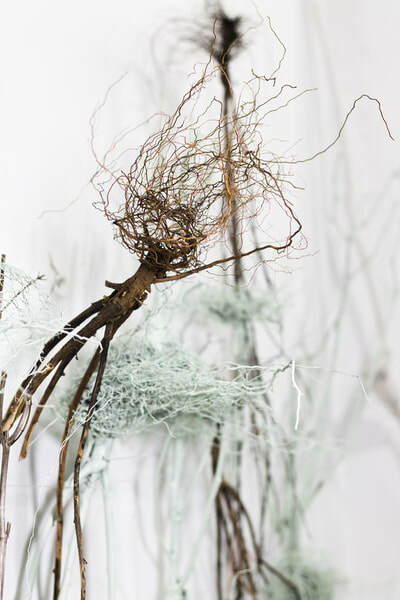 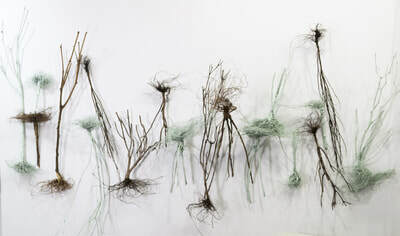 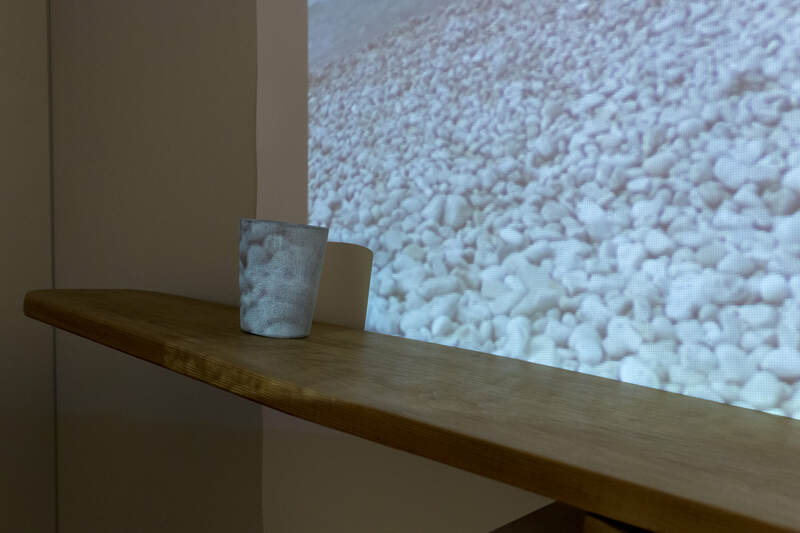 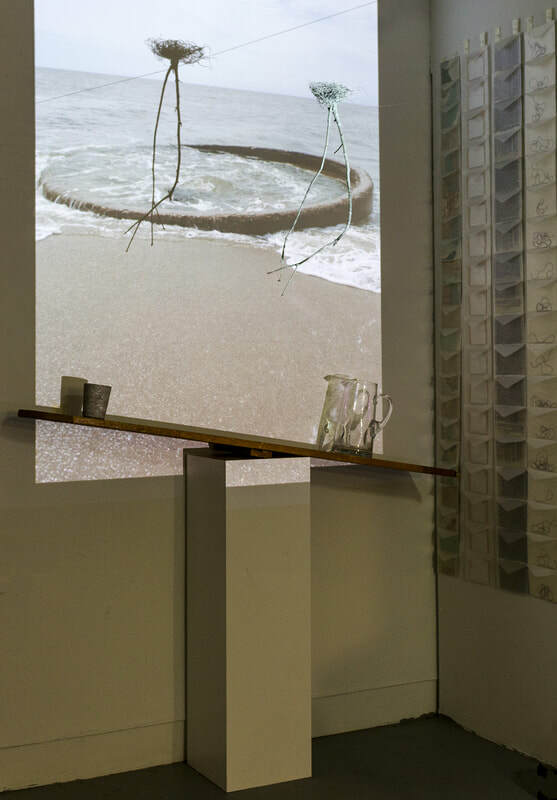 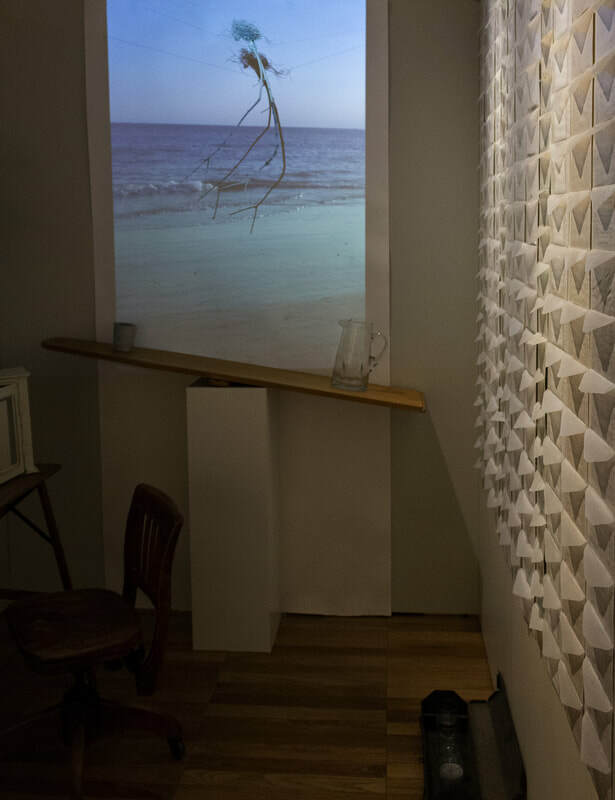 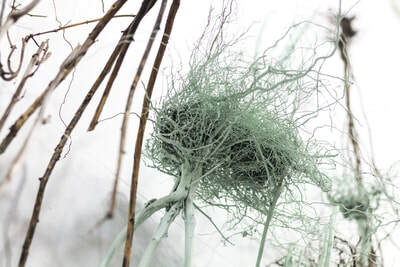 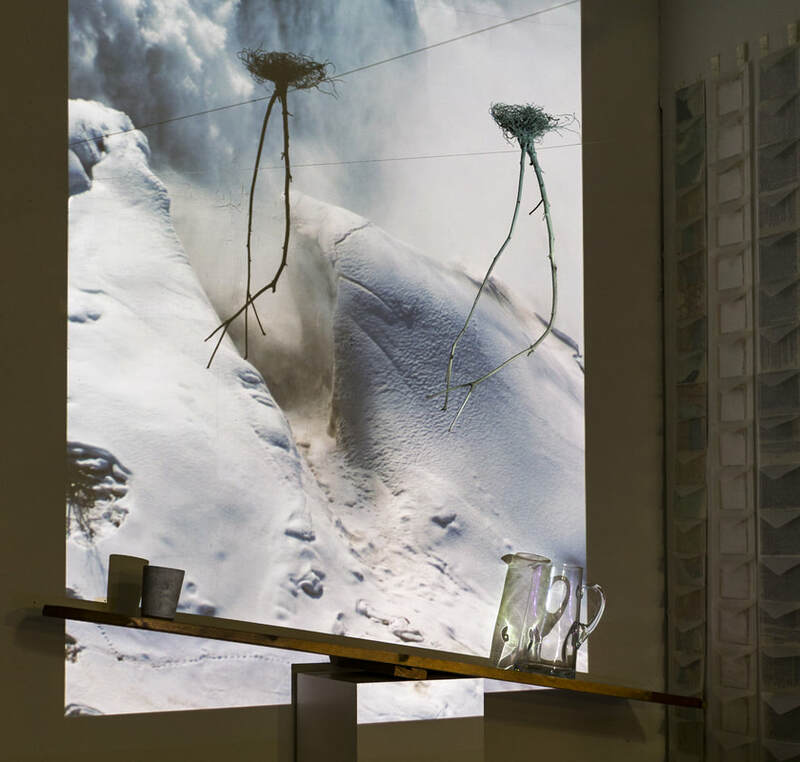 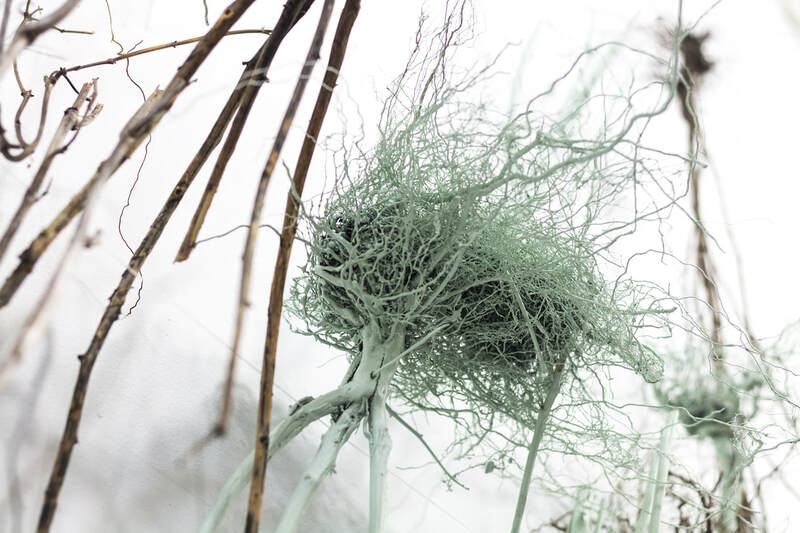 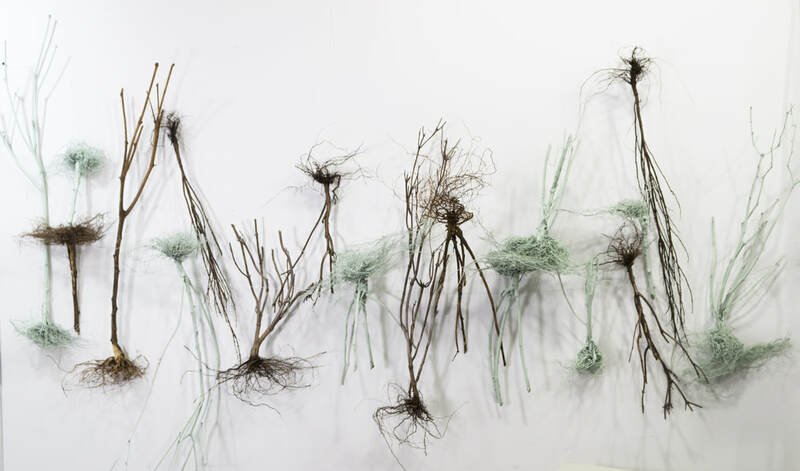 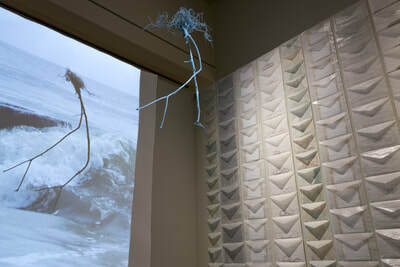 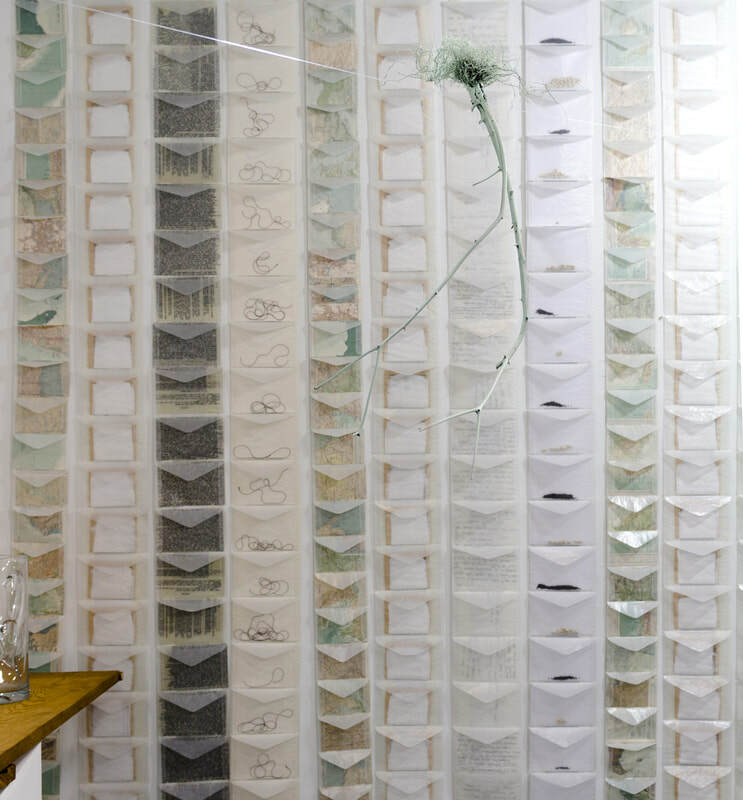 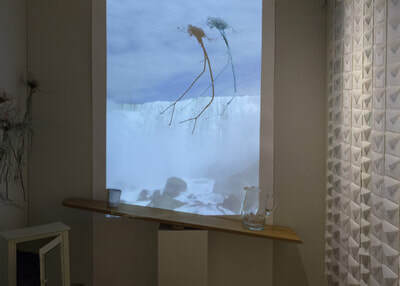 Unfolding is an interactive installation contemplating the ways in which wisdom unfolds. 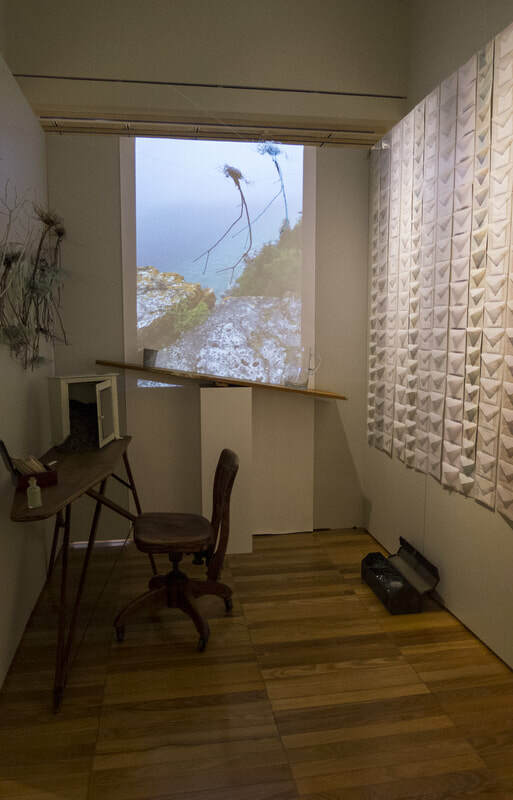 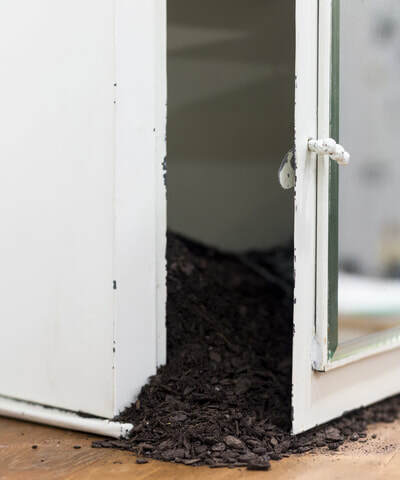 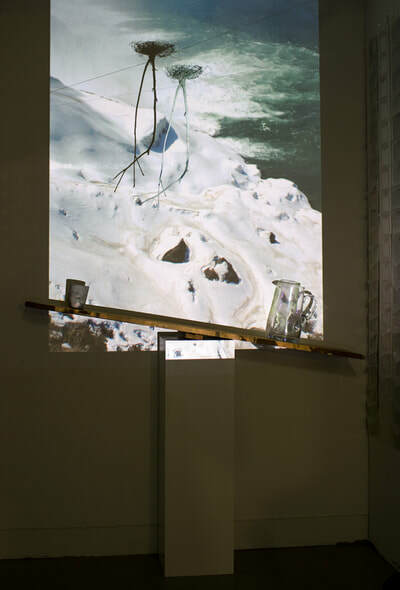 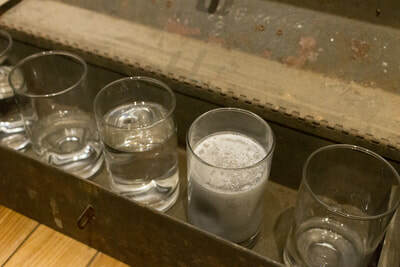 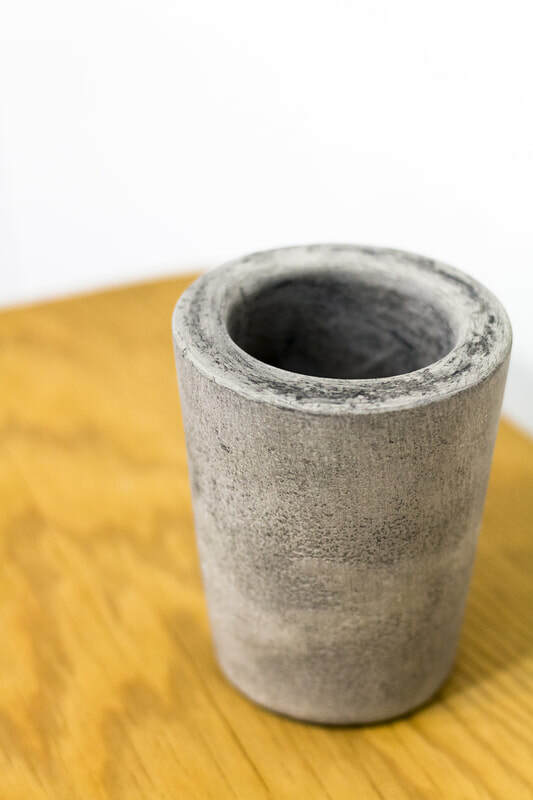 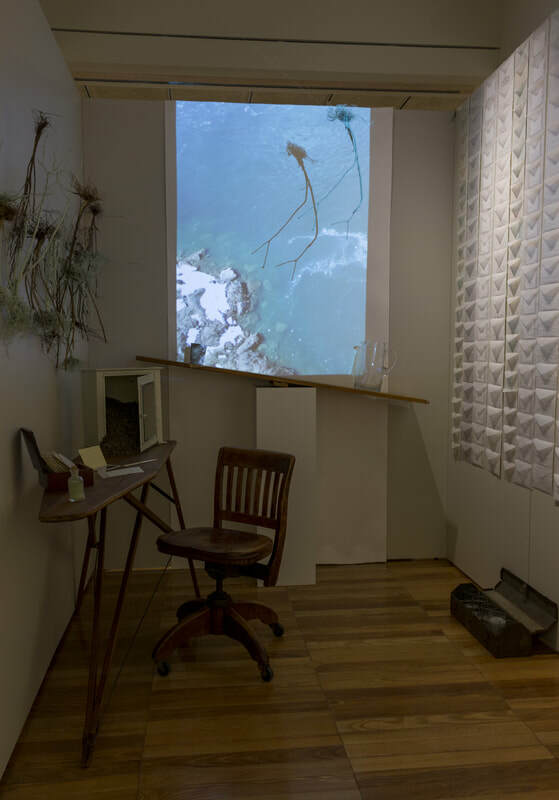 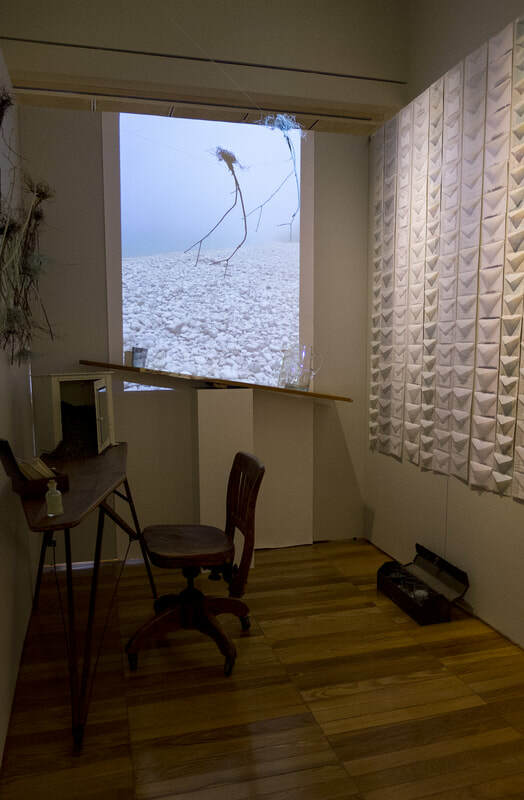 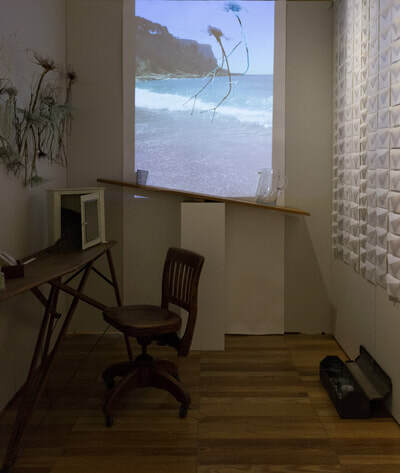 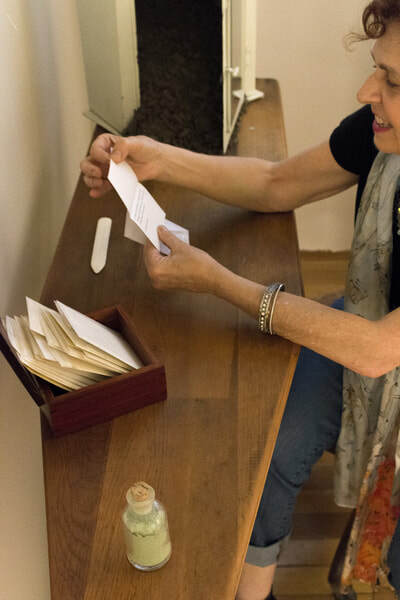 Viewers are invited to step into the space for an intimate look, and to sit at the ironing-board-transformed-desk, opening the envelopes placed inside a wooden box. 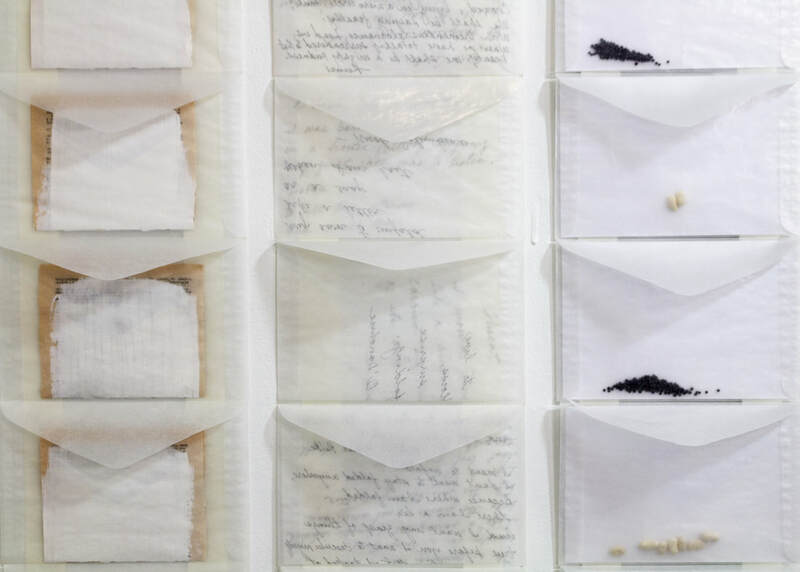 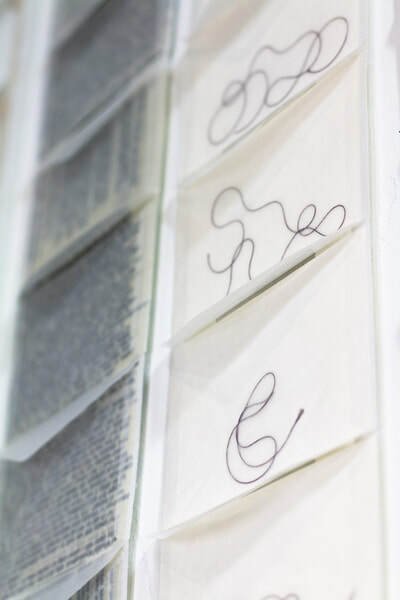 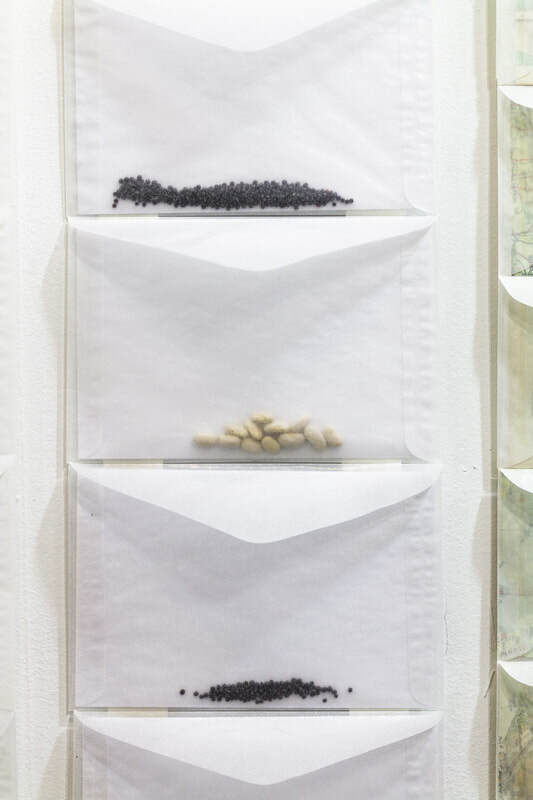 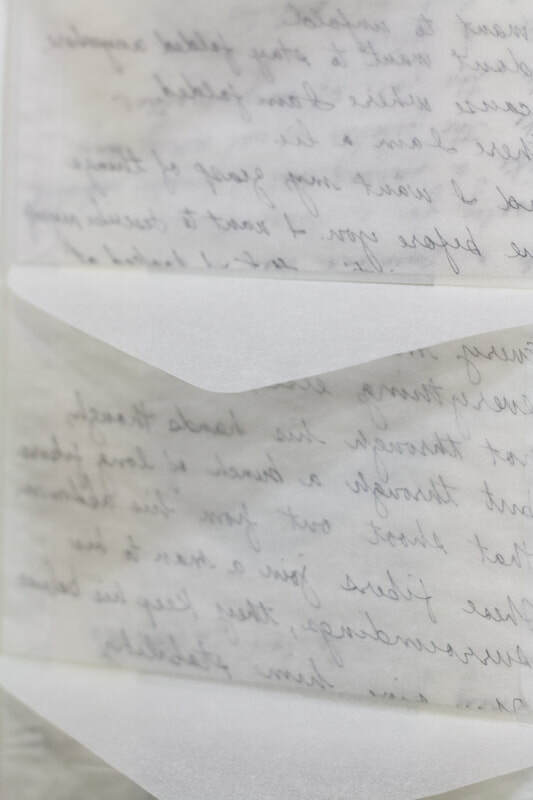 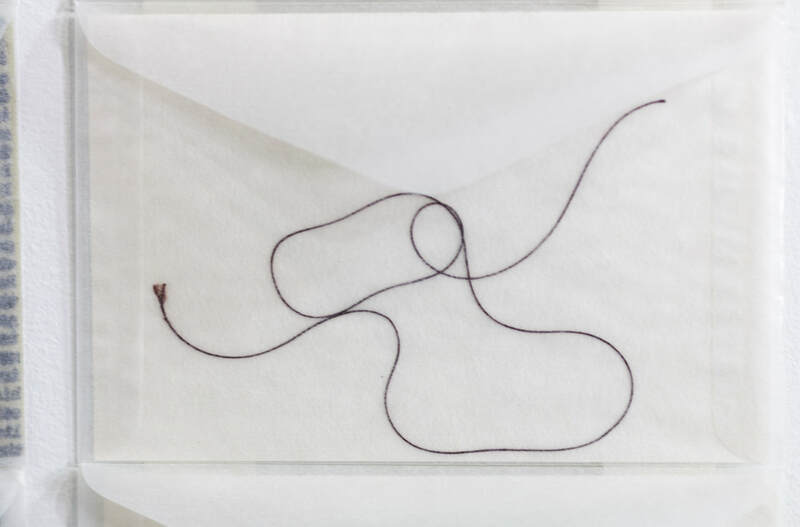 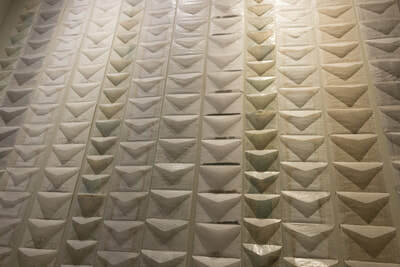 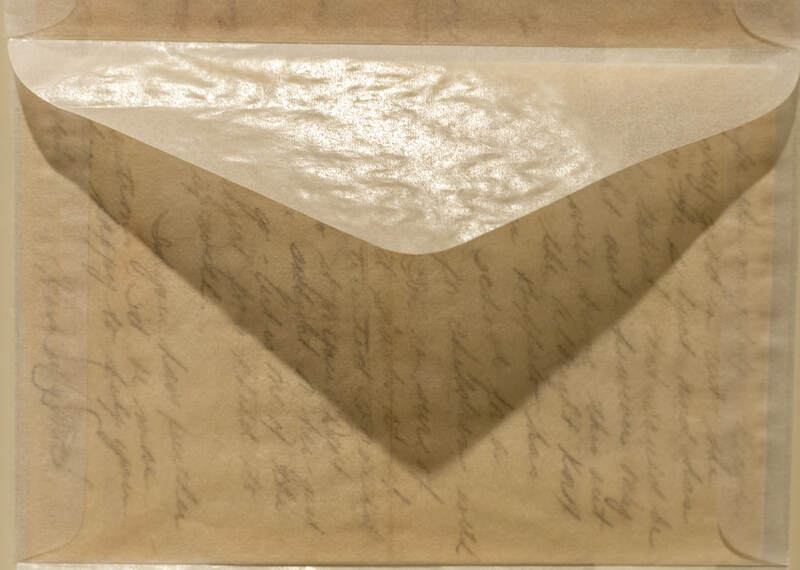 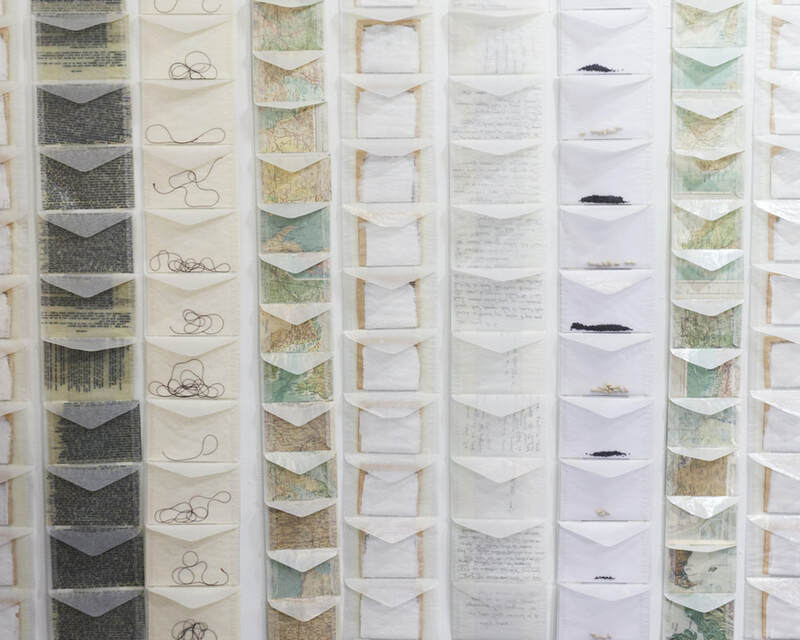 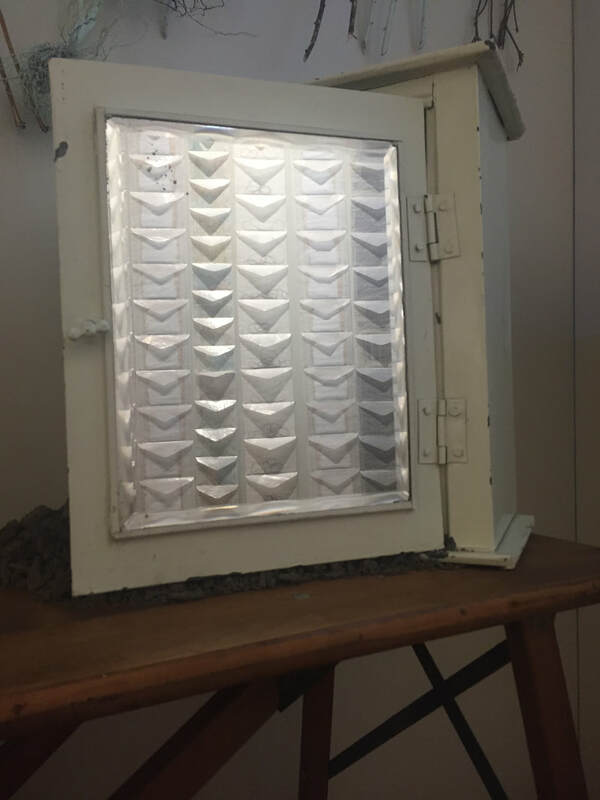 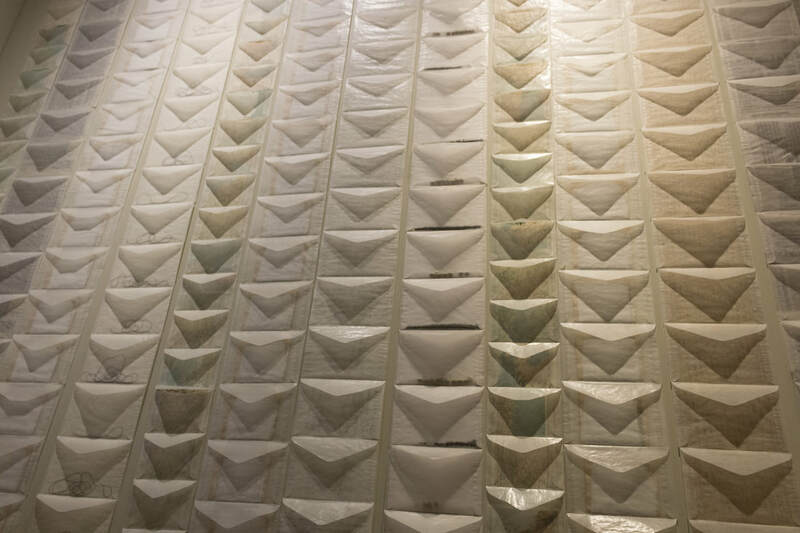 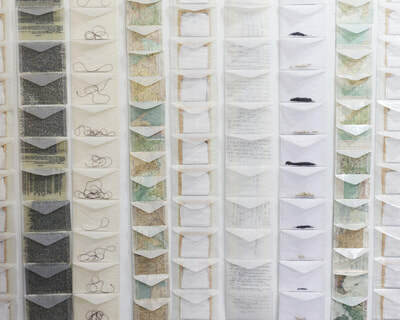 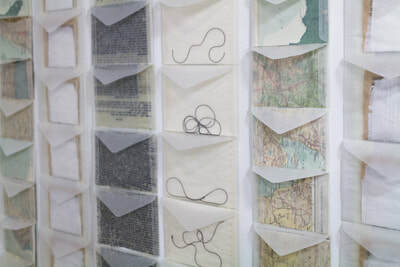 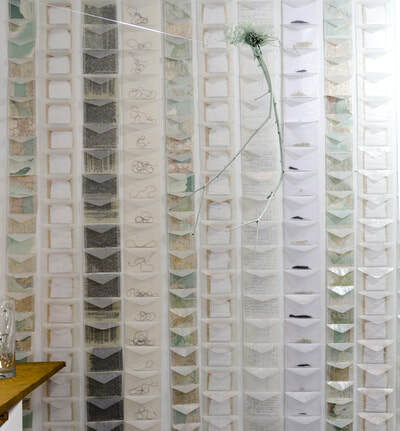 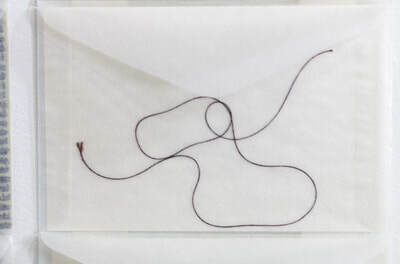 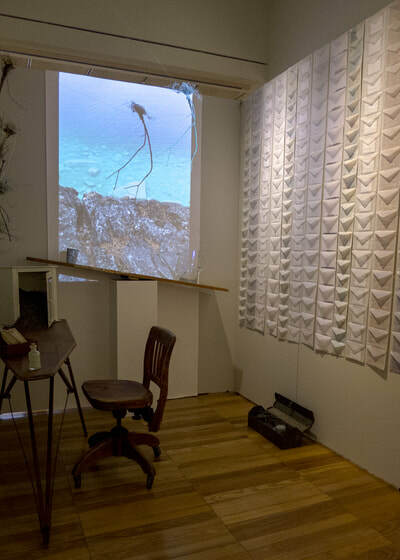 Inside the envelopes, poems/quotes/images are intended to provoke further examination of the connections between the ordinary and sublime objects and gestures presented within the installation, as well as, for the viewers to embody the metaphor of folding and unfolding. 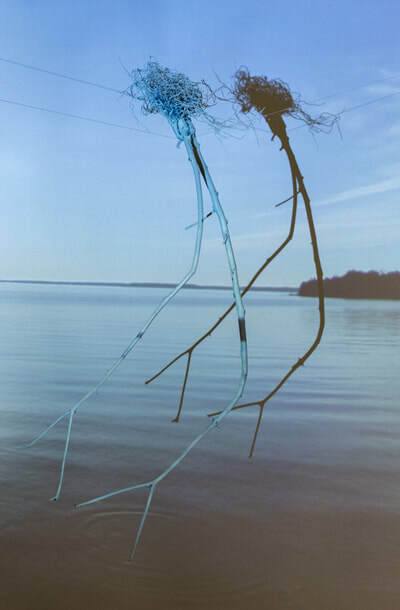 The relational poetics examined in this piece hopes to inspire reflection and dialogue on the wisdom currently being revealed within each person. 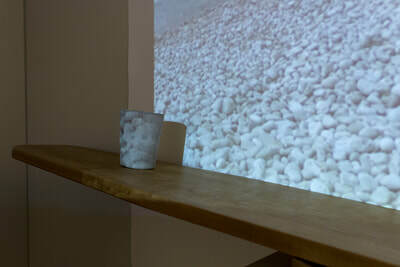 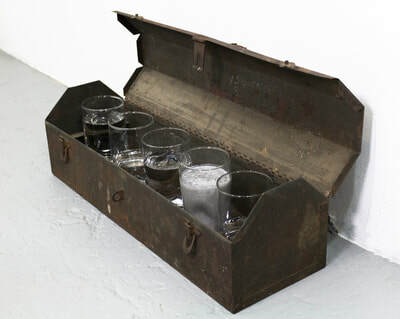 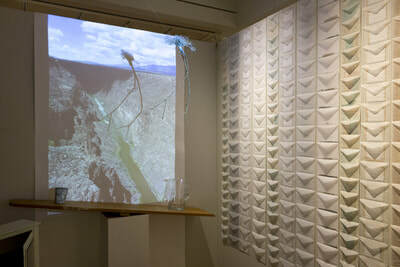 Materials: water, earth, roots, pitcher, glasses, cement, medicine cabinet, ironing boards, desk chair, lunch box, glassine envelopes, maps, silk thread, mustard seeds, lima bean seeds, dictionary pages, projected images, acrylic paint, spray paint, paper, bone folder.